One of the most exciting things about Vivid Vision is that it is available in a Home version that Optometrists can prescribe to patients for therapy in the comfort of their own home. And now, to make the Vivid Vision Home experience even better, we’re launching support of the best all-in-one Virtual Reality headset on the market—Oculus Go! The Oculus Go headset provides an affordable, easy to set up, all-in-one VR experience that patients will love. 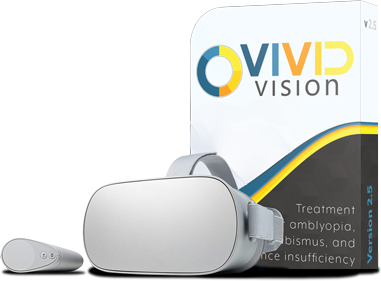 Vivid Vision Home provides convenience never seen before in a home-based vision therapy platform. If you're a patient interested in Vivid Vision Home, use our doctor locator page to find a Vivid Vision provider near you! If you're a licensed eye care professional interested in offering Vivid Vision Clinical or Home to your patients, please set up an appointment to talk to one of our representatives! If you’re a current provider, touch base with your Vivid Vision representative or contact us to discuss some exciting end-of-year pricing for Vivid Vision Home!